Arlene Kalfus is being remembered as a smart and energetic 81-year-old lover of travel and the arts who filled her days enriching both body and mind. Kalfus, a resident of Gateway Plaza in Battery Park City, was killed Thursday evening, April 4, after being struck by a Downtown Connection bus operated by the Downtown Alliance. Police said Kalfus had just gotten off the bus before it hit her. (In a differing account, The Broadsheet quoted witnesses who said that Kalfus had just gotten off an M9 bus before being struck by the Connection bus.) She was pronounced dead at the scene, near 325 South End Ave., the building where she had lived for more than 30 years. The driver has not been charged and the incident continues to be under investigation, police said. South End Avenue is a wide, five-block-long street between Liberty and West Thames that over the years has been the subject of three different plans to improve safety. A proposal presented in 2017 by consultants for the Battery Park City Authority was approved by Community Board 1 last year. (Information on those proposals can be found here and here.) A “detailed design” for the improvements are expected during the last half of this year, with construction expected next year, the Authority said in a statement. “We need to make this a rallying cry,” Tammy Meltzer, chair of CB1’s Battery Park City Committee, said of the Kalfus tragedy. Meltzer said the city’s Department of Transportation should already have carried out some of the recommendations, such as a traffic light at Rector Place and the relocating of a Citi Bike station near Gateway Plaza. “The whole goal for the renovation of South End Avenue is to protect the most vulnerable,” Meltzer added. “And to put traffic calming measures in to create a safer environment for everyone. A DOT spokesperson has not reponded to a request for comment. Submitted by admin on Wed, 04/10/2019 - 1:53pm. 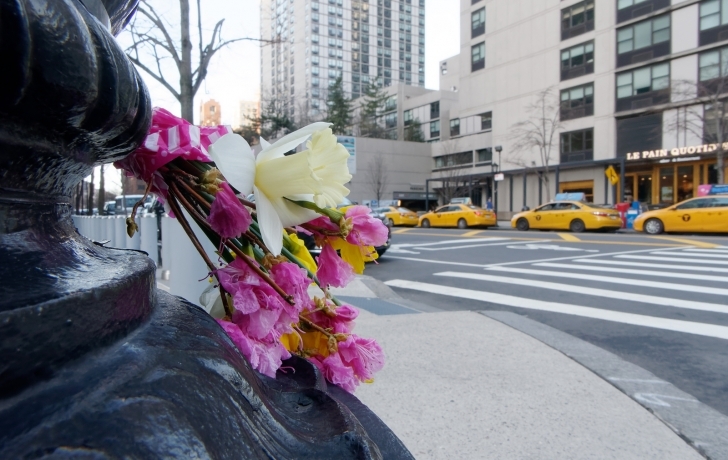 Most of us react to tragedies like the death of Gateway Plaza resident Arlene Kalfus, who was run over on South End Avenue by a Downtown Connection bus last week, with expressions of sorrow and, perhaps, resolve to alleviate the conditions that contributed to that deadly incident. Unfortunately, one resident chose to use Kalfus's death to vent about a nearby bike-share dock that, from all accounts, had nothing to do with the fatal crash. It's unfortunate that you chose to amplify the resident's uninformed speculaton by quoting her in full. Couldn't you have at least balanced her personal gripe with informed commentary from a downtown safe-streets advocate? Or, better yet, kept it out of the article altogether? Submitted by admin on Mon, 04/08/2019 - 3:47pm. I’m more than a little perturbed that the Tribeca Trib found a way to blame Citi Bike for the killing of a woman, when, in fact, she was killed by a bus driver on a poorly designed, virtually unenforced double- and triple-parking zone in Battery Park City. Reminder: Car and truck drivers killed every single one of the 200-plus people killed on NYC roadways last year. Not a single person was killed by a cyclist, let alone a Citi Bike rider. The bike-share system has enormous positives for the city — pollution-free transit; a constituency for more bike lanes, which make roadways safer for all users; and, of course, an alternative to crowded subways. If the Trib wants to report on the system’s flaws, fine. But blaming a bike-rental system in a story about the killing of a woman by a bus driver seemed to be the wrong way to do it.